Fire Ants are some of the worst ants to have around. They have a red color, which is partially how they get their name. They are aggressive, and will charge and try to bite and sting you for disturbing their home. They can be identified by their red color and their mounds sticking out of their nests. 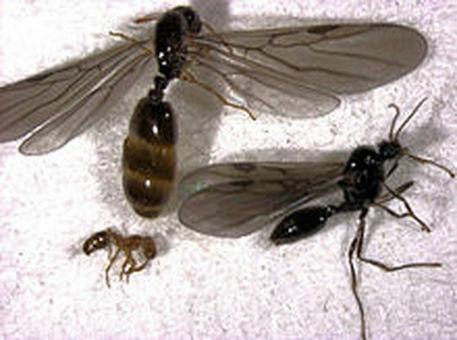 In a colony, there can be winged and non-winged types of ants. Fire ants generally do not like damp-cool conditions, instead preferring the warmth of the sun and a drier climates. If given the chance, a Fire Ant will eat anything. They like protein rich food, greasy food and sweets. They will kill much larger animals, such as young birds or rodents, and eat dead animals killed by other animals. Be very careful that you do not leave a baby or small child around Fire Ants, because they will bite and sting and can do a lot of damage. If you come across Fire Ants, it's best to leave the area because they can be highly aggressive. How do Fire Ants get into my home or business? It starts with one, then the rest will follow. The first ant finds food in your home then brings it back to the group. More of the group will follow the scent trail back into your home, often the kitchen or any area with sweets or open foods. Once the ants find their way into your home, it's hard to stop them without help. How you handle your Fire Ant infestation depends on the location of the nest and the severity of the problem. Since these ants bite and sting you will want to deal with the infestation quickly, to prevent painful bites that can leave welts. Contact RVA Pest Control today so we can help you crush your ant problem! Click here for information on Ghost Ants!